I love Caribbean food, I honestly can’t get enough of it and sadly don’t get enough of it. I cook a mean Saturday Soup which I have on good authority is “as good as Mummy’s from Trelawny”, but I come from a long line of very enthusiastic carnivores so vegan food has never really been on my radar. 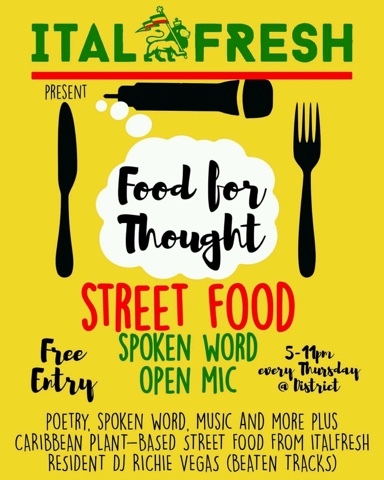 Until now… I popped down to Ital Fresh, the plant-based street food pop up in Liverpool’s cool and creative corner the Baltic Triangle. Now, I’m kinda familiar with Ital food – the Rastafari principle eschewing preservatives, additives, and meat (mirroring many Jewish dietary beliefs) – but it’d been a long time since I tried any. 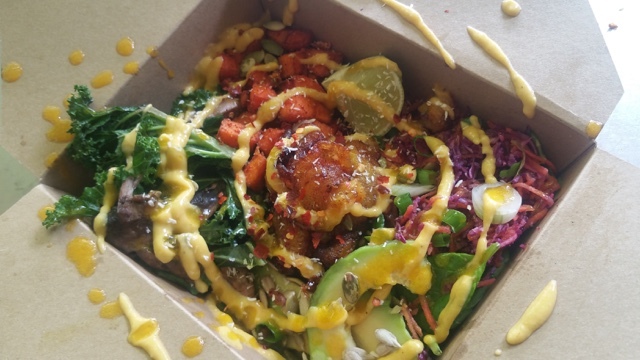 For me, my hipster klaxon was well and truly going off – not only was I going very much ‘off brand’ checking out vegan food instead of my go-to cheesy burger fail safe, but Ital food with the added elements of spoken word and reggae? My smug blogger points were off the Richter scale! Joking aside though, with chain restaurants, trendy bars and barbecue joints widespread in the city, it’s refreshing to find something so culturally unique and I’d urge anyone to go along to try something new with a friendly welcome. Chef Poppy has been recreating Ital classics with a modern twist at the Ital Fresh pop up down at the Baltic area since May. With influences from all around the Caribbean and recipes handed down by partner Dan’s Jamaican Nanna Pearl (who sounds like a proper boss cook with that name alone!) she’s produced fresh and healthy street food – for example using quinoa instead of rice in her rice ‘n’ peas for a protein packed take on an old family favourite. Poppy & Dan told me their own favourites from the menu: their super healthy and filling i-tal superfood salad features sweet potato in paprika, avocado, mixed seeds & spinach dressed in a balsamic mango drizzle, caramelised plantains and coconut quinoa. Poppy’s Plaintains are also a real hit with their customers – including son of the late great Bob Marley, Julian ‘JuJu’ Marley on his recent tour – either savoury style or drenched in dark chocolate with toasted cashews and coconut. Clearly there’s only one thing for it: try both! The Funky Kingston Fries were good enough to make me forget that I don’t actually like coriander (or maybe I do, but was in denial?) 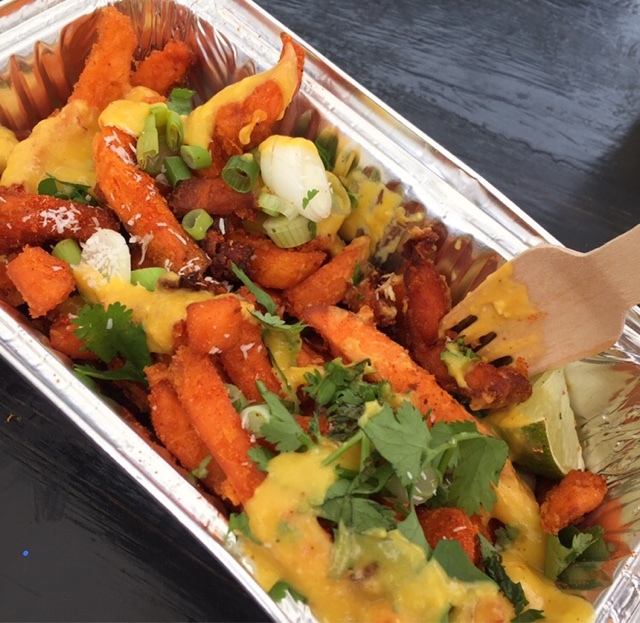 and they just blow every other sweet potato fries you’ve ever had in your life out of the water with their jerk mayo style dressing and garnished with all sorts of tasty bits and pieces like scotch bonnet and spring onions (and coriander!). 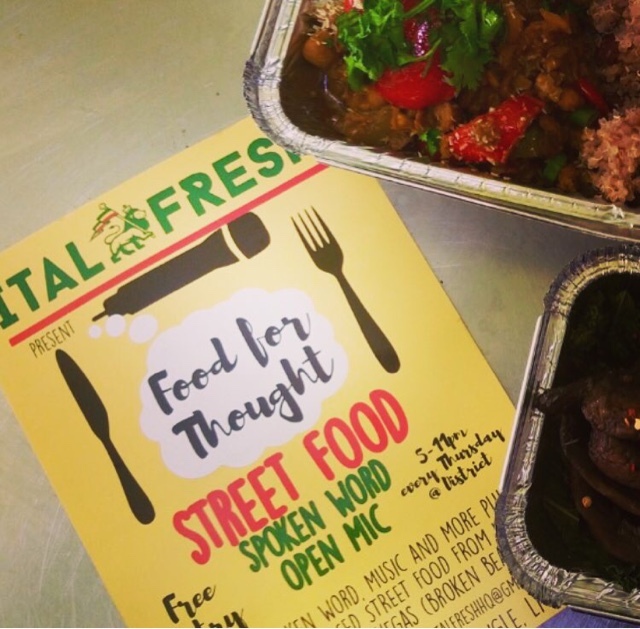 Their Food For Thought event is held in a chilled out candelit venue every Thursday night from 5 til 11pm (performances starting at 7) at District, on the corner of Jordan Street and New Bird Street in the Baltic Triangle mixing free entertainment with delicious dining. All open mic performers get a free portion of Poppy’s Plantains as a thank you – so maybe you’ll see me there with a dub poetry ode to those Funky Kingston Fries…! The healthy resources connected with foods! Hi there, in Liverpool for a few days can anyone tell me where to find ital fresh pop up restaurant ? Todays is October 16, 2017. Thanks for quick response.